Grandroids is a cross-platform artificial life simulation and experiment in artificial general intelligence being developed independently by Steve Grand, the creator Creatures. Backers of its Kickstarter campaign have received several demo releases, including source code, since 2014. Screenshot of an early version of the Grandroids world. The creature is known as a Gloop. Like Creatures, Grandroids simulates the biological processes of creatures interacting with each other, but at a more basic level. The brains, for example, output motor commands, in contrast to the high-level verb-object pairs of Creatures, and the brain architecture has been heavily guided by metrics like whether creatures are able to stand and look at stimuli. 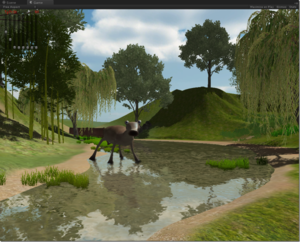 The 3D environment has a day/night cycle, clouds, varied terrain, water and stars. The game is implemented in Unity. "I’ve been working on the theory behind a new breed of artificial life for years, now, and recently had what I hope is the scientific breakthrough I’ve been looking for. So I’ve started work on a new game. I don’t know what the scenario will be yet or what the final creatures will look like, but it’s basically the same concept as Creatures, except this time in 3D, with real physics and with vastly better biology and brains. Ever since C1 I’ve been trying to understand how the mammalian brain gives rise to imagination and mental imagery, and I think I’m really onto something now that can be implemented in real time on a PC (after all, computers are at least a thousand times more powerful than they were when I started writing C1). I think I have the key to an artificial life form that can actually think. Norns could react but they couldn’t think – they couldn’t make plans, have hopes or intentions, dream dreams, learn physical skills, etc. Higher consciousness can’t exist without an imagination either. It remains to be seen how smart they actually prove to be but they’ll certainly be much more realistic than the norns in lots of ways and hopefully a lot more fun to look after. There’ll be an API for community extensions and tools, too, of course, and a lot more to learn about their physiology and behavior. I’m thinking in terms of creatures somewhat like orangutans in character, but we’ll see. Hopefully there will be several species. First I have to build their brains, and until a few weeks ago I was stuck on a really tricky problem in the layers of their brain that learn to recognize and classify things. But I think I’ve solved that now and I’m ready to get back to coding this week. .. I’m really excited about it potentially starting up again at long last." Gloop is a creature included with the v0.1.2 demo and shows the state of locomotion, balance and attention in the Grandroids brain architecture. Gloops can hunt and eat Throgs. Previous test creatures include Gollum, Quad, Bones and Spot, the latter designed to test quadrupedal walking.